The safety of your files and documents shouldn’t be left to luck, as a necessity your smartphone carries all your important information and therefore entrusting these data to a capable hand is a wise choice. PhoneRescue Data Recovery Software by iMobie is capable of recovering a wide range of file types including: messages, contacts, photos, call history, calendar, reminders, and other data from third-party services. Just like the moniker, PhoneRescue helps mobile phone users to rescue their beloved information, in scenarios like: accidental deletion, data corruption or outright data loses. ForceRestore: Help to Save Data from Inaccessible Backups. NO-DATA-LOSS Technology for Max Success Rate. Accurate Data Recovery with SmartCompare and SharpMatch. Thunder-Extraction for Risk-Free Data Recovery. SecureLOGIN with The Strongest Encryption technology. 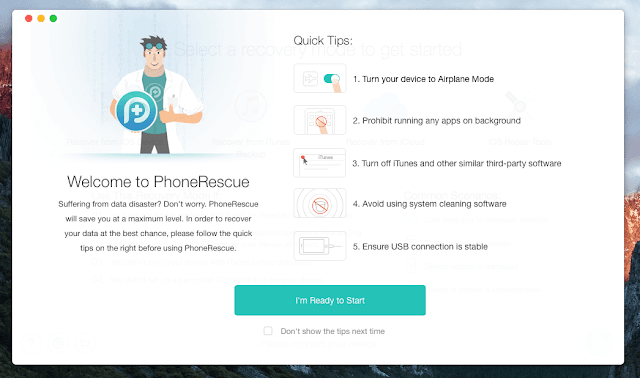 PhoneRescue can be downloaded on Windows and macOS computer, and you’ll need to connect your iPhone/iPad or Android device to a PC to run the program. This scenario is based on MacBook Pro running El Capitan. The PhoneRescue software passed the virus scan as 100% free of virus/malware issues. Also, it is worthy to note that iMobie is an Apple Certified Developer, so there's no reason for fear as its software have passed some rigorous testing by Apple. And the scanning process is read-only, as such it won't affect any existing data on your device. It explicitly ask your permission before accessing your data from iCloud, but still it is recommended that you keep a back up of your data on the device before using the software. 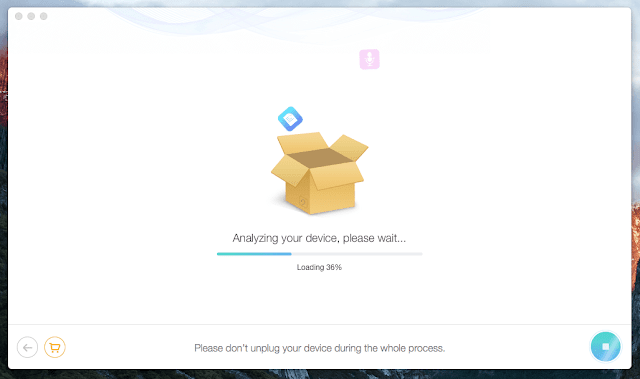 The download and installation process is pretty easy; it launches with an animation of PhoneRescue icon, which is followed by the “Quick Tips" window. 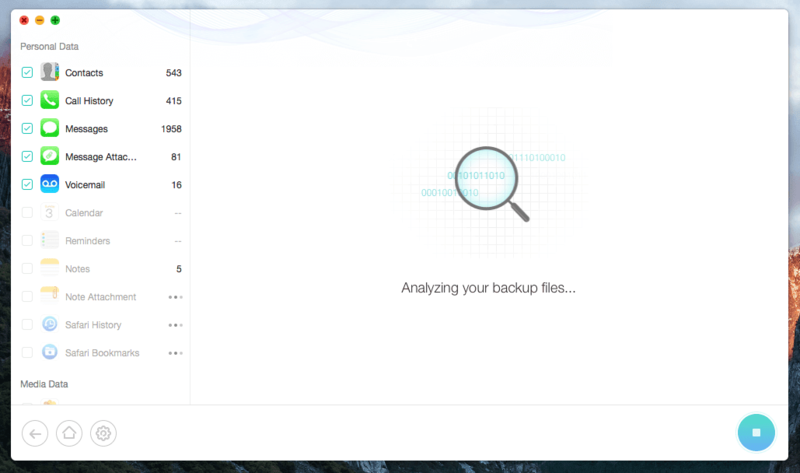 The window contains a list of instructions on how to maximize the process of data recovery. 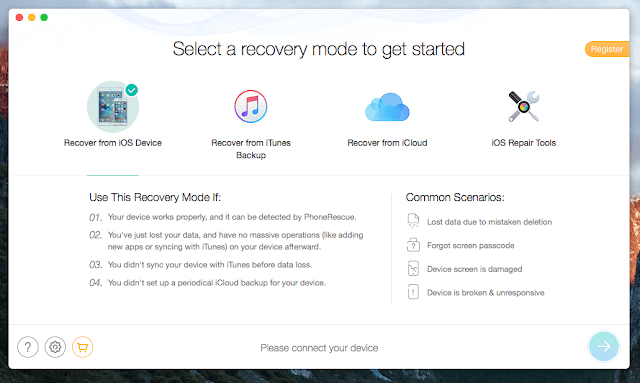 It offers four recovery modes: Recover from iOS Device, Recover from iTunes Backup, Recover from iCloud, and iOS Repair Tools. But in this review we’d be talking about how to recover your messages from iPhone. This is the first mode and it is best for recovering items deleted from your iPhone including: photos, videos, messages, etc. And it is ideal especially if you don't have backups or you’re unable to retrieve the content from iTunes or iCloud. First, make sure your iOS device has been recognized by your computer. Then the app will begin to analyze your device, the process takes only a few seconds. The results will be ready within few minutes, and then you can select the messages you want to restore from the recovery list. It worthy to note that “Recover from iOS Device” mode tends to discover more files than what was actually deleted, which makes it a bit time-consuming to sort out the particular files you want to recover. PhoneRescue is perhaps a good choice, when you accidentally delete messages off an iPhone, as it gives you the assurance of recovering your lost data. The price starts at $49.99 for Single license (1 PC), and $69.99 for Family License (5 PCs). Though, there’s a FREE version for both Windows & Mac to try out the software.